Over 65 participants from 16 different companies attended Nomis Solutions’ fourth global pricing optimization forum on “Leveraging Pricing Excellence in the new Era” for banking and finance May 10-12, 2010 in San Francisco, California. 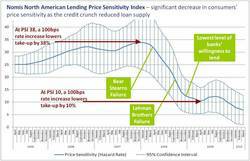 The Nomis North American Lending Price Sensitivity Index showed significant decrease in consumers' price sensitivity throughout the credit crunch. Nomis Solutions, the leading provider of Pricing and Profitability Management solutions for financial services companies, concluded its fourth global price optimization forum and user group in San Francisco from May 10-12, 2010. A total of 65 attendees attended the two day conference to discuss the latest analytic research and technologies in loan and deposit price optimization. Attendees included executives from banks and finance companies in the US, Canada, UK, and South Africa, representing combined assets under management of over $8.3 trillion. Have consumer attitudes, price sensitivity, and willingness to borrow/save at different price levels changed as a result of the global financial crisis? Nomis Solutions presented its North American Banking Consumer Price Sensitivity Index, which went from a high of 38 in the spring of 2008 to a low of 10 in the spring of 2009. Since then, consumer price sensitivity to lending rates has already increased by 20% from its low and is forecasted to continue to rise as banks’ willingness to lend returns and rate competition increases. How will changing regulatory frameworks impact pricing and profitability? Attendees specifically discussed how Reg E will impact deposit pricing, and how the Card Act and potential CFPA regulation will impact lending pricing, requiring better pricing technology to assess risk, ability to pay, and price sensitivity at origination. How will pricing strategies and tactics have to adjust as interest rates rise in key economies over the next 18-24 months? Consensus was that rising interest rates will require more frequent pricing cycles, impact consumer preferences, and will significantly impact portfolio retention. How can banks and finance companies develop a clear understanding of the consumer beyond the traditional portfolio view? Attendees discussed case studies of the Nomis Market Schema and the recently introduced Nomis Score™, a price sensitivity score used to rank order consumers based on the value they place on price vs other features.